Some mentioned this on Jezebel yesterday, but damn if the end of this episode wouldn't have been aces as the end of this show. By the end of this episode the only people who are doing well are Bob Benson, Joan, and maybe Jim Cutler. Which of Don's sins does he feel he can't be forgiven for? If they had fired Don instead of putting him on leave, it would have absolutely worked as a series finale. Ted and Pete are off to new beginnings, Peggy is unsatisfied romantically but is the acting creative director at the NY office (since we don't know who Lou is yet), Roger has wormed his way into Joan's good graces and a relationship with his son, Megan is cutting her losses and declaring an end to her unhappy marriage, and Don has stepped into the sun (to borrow a phrase from Scandal) and shown his kids who he really is. The only person who doesn't have some sort of resolution to his or her story is Betty. but damn if the end of this episode wouldn't have been aces as the end of this show. Absolutely. There was quite a bit of symmetry between this episode and the very first episode, "Smoke Gets in Your Eyes." In the latter episode we see Don behaving as though he has no wife and children, but at the end we see the truth. Don has a wife and two children and lives in Ossining. 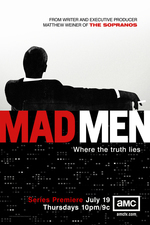 By the end of the first episode we have learned there is not much truth to Don Draper. In the present episode we see Don forcibly compelled by the consequences of his own actions to not only face the truth about himself, but also to begin to share that truth with other people. Attempting to begin to, as entropicamericana said above, be himself. It didn't go over well at the agency due to incredibly poor timing, but his timing couldn't have been better by sharing a shameful, in his eyes, bit of himself with Sally. So at the end of this episode Don goes "home" and begins to heal the damage done to his relationship with Sally and attempts to begin to be more honest with her. Another bit of symmetry between the two episodes is the bar scenes. When we first meet Don in "Smoke Gets in Your Eyes," we get a shot of Don from behind and we find him working on Lucky Strike. The song "Band of Gold" is playing, the bar is upscale and full of people, and Don is at the top of his game. In this episode we are introduced to the bar scene with a shot of Don from behind and he is not working. He is there solely to drink. The song "Band of Gold" is playing, the bar looks like a desolate place for alcoholic dead-enders, and Don is definitely not at the top of his game. Also the shot of Peggy from behind sitting in Don's chair. That's a nice bit of overall symmetry. Margaret hands Roger Ellery's drawing and says "He made it for his Pop Pop." Ellery has depicted Roger with a golden crown, a bag of gold in each hand, and wearing a purple robe. Like he's King Croesus or King Midas. Roger couldn't have gotten a clearer picture of how he's viewed in his daughter's family. Sheraton Royal Hawaiian shows up at the agency and Don can't be found. Couldn't help but think that Don wasn't there because he was off enacting the disappearing man ad he presented to them in the first episode of the season. Don: "Nixon's the president. Everything's back where Jesus wants it." Bewitched is playing on the TV in the bar. Don steals Stan's idea of going to LA! Peggy's dress - "it's all I wear" sounds like an advertising slogan. I see a print ad - beautiful woman from the collarbones up, no jewelry or visible clothing. "it's all I wear," and a little Chanel no. 5 bottle. All these people, looking for reinvention. Oh, wow. Peggy looks like a million, billion bucks. Pete looks like a caricature of himself. Sally looks like she's in a different VC Andrews novel. Betty looks like she stumbled out of a Lawrence Welk ensemble number, complete with bubbles. Megan looks like she's a dissolving pink meringue. Joan looks worried, Roger looks high. The boys look like trouble (Pete still has the eye patch!). And Don is wearing a dust-blue coat with tan britches. John Slattery as Dr. Norman, disgraced anesthesiologist, in the fourth season of Arrested Development was a great bit of casting. The song in the trailer is "Love Hangover" by Diana Ross. It was released in 1976. Hmm. Just a song that Weiner thought fit the teaser and was close enough to the time period? Or will part of the episodes take place in the 70's? Hmm. Whatever the case, I'm pumped for these last episodes. I thought they said they weren't going to go outside the 60s at all? Thinking about the promo stills, the white of Megan's outfit makes me think wedding, or that she's dead (and is meant to be angelic). I don't think they'll kill her though. I'm not really reading too much into it. The song probably just fits the trailer and the last 7 episodes overall. But Weiner has to know he is teasing the fans with that song. Also the backdrop of the final shot of Don looks very Californian to me. Pete. So there's that line from the very first episode: "You'll die in that corner office, a midlevel exec with a little bit of hair who women go home with out of pity." And I don't think they'll bring back that rifle, but I hope they make some final visual reference to that in Pete's last scenes in the series. That trailer is SO seventies. Did you see the sideburns on Roger??? ?